How likes of B&Q make profit from garden center range? How do the likes of B&Q & Home Base make such a profit from the garden center range? With margins of +140% on high ticket items that cost the retailer virtually nothing to stock, this was something we really wanted to find more out about. So to find out how they do this Garden Trade Specialist interviewed WhatShed.co.uk, the UKs most authoritative website on garden buildings. Q: So WhatShed, how did you find out that this was such an important profit center for the retailers? A: From an online perspective WhatShed is one of the largest traffic drivers for some of these retailers. Over the last few years, they have opened up to us and have revealed to us that the primary profit from the garden center sections of the business comes from the sale of high margin garden buildings. Q: Why is it that they make so much from this type of product? A: The typical bricks and mortar retail store only have a small square footage dedicated to garden center type products. Having said that almost every bricks and mortar store has a summerhouse type building that displays a massive range of garden buildings. This sample build allows the customer to clearly see the quality of the product while at the same time displaying a significant range of products. This leverage of retail space allows each store to effectively display what would be a football field's worth of products from one tiny high quality well build show building. It's surprisingly a very lucrative use of space for them. Q: What are the typical types of products that they make the most on? 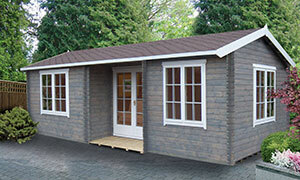 A: Typically, the product ranges that sell the most are playhouses, arbors and increasingly log cabins. The following are some examples of the typical sort of margins over trade that can be made. 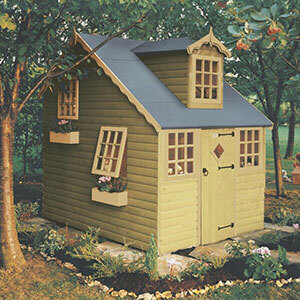 • Playhouses, the cottage playhouse pictured has a current margin of 178% over trade for one major retailer. • Log Cabins, the popular log cabin pictured has a current margin of 144% over trade for one major retailer. Q: What is the typical turnover contribution something like this could make per location? A: That’s a really good question and it obviously has a lot of variables. When we asked that question some of the retailers were obviously very cagey in telling us any hard facts. They did, however, say that typically each location added high five figure and some six figure turnover volumes to each location. They also said that per square foot they were some of the most profitable additions to the range. The products listed in this article are from Shire Garden Buildings, the UKs leading supplier of wooden garden buildings to the trade. If you would like to find out how you can leverage your retail space, then please contact Shire Garden Buildings to find out more. Keep those tails wagging with PitPat! If you’re looking into ways to keep your dog active, then read the review below on the wonderful PitPat.